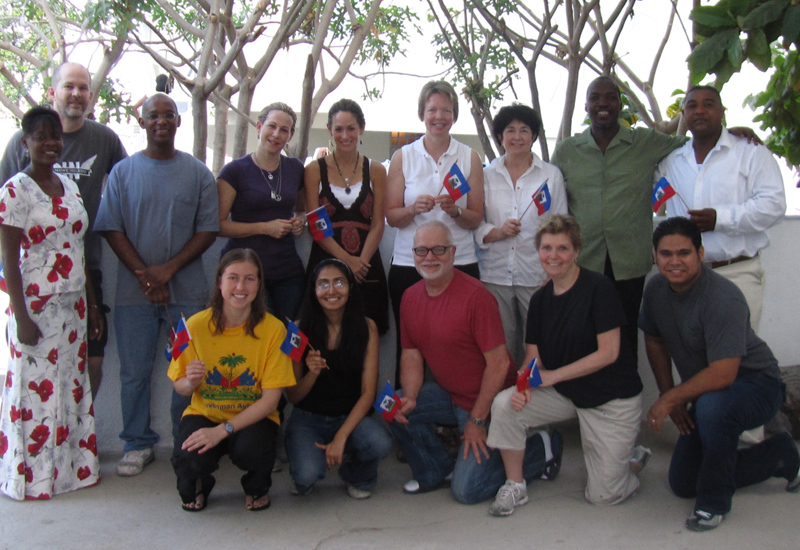 Tom Wilson, assistant vice president, Research Affairs, and senior research administrator, chronicled his visit to Haiti with a medical team from Rush University Medical Center. Day Seven: Today we traveled to a church in Delmas a few miles from our hostel (a trip of a few miles can take 45 minutes to an hour in Port-au-Prince). The medical ministry at this church is an established, well-managed organization headed by Dr. Jeff Bercy. A section church was already divided into five exam rooms, a triage area, waiting room and pharmacy. All patients were triaged prior to our arrival and waiting to be examined by a doctor. The clinic had a number of volunteers who could supplement our translators and assist in many other ways. There also was a Haitian pediatrician who was very helpful in examining and diagnosing the many pediatric patients. After we had seen all of the patients in the clinic that day, I distributed soccer balls and basketballs to the volunteers and children. We left the children with treats and we gave a dozen softballs and a basketball to our logistics coordinator that can be given to needy children when he returns home to the Dominican Republic. After six days of seeing patients, we were running short of some medical supplies even after we had replenished some of the medications the previous afternoon. We were out of children’s vitamins for the past two days and dispensed the last of the adult vitamins early in the day today. Most patients are in need of nutritional supplements and many suffer from dehydration. Each team member brought at least one case of Gatorade in his or her luggage, but we were rationing what Gatorade we had left for the last two days of clinic. We saw over 250 patients today and over the six days of clinical activity we had administered medical care to over 1,200 patients. This may seem like a large volume of patients, but when traveling through Port-au-Prince and through the Haitian countryside it becomes apparent that this is just the smallest percentage of the population that are in need of quality medical care. I have been moved by the graciousness of the people that we have cared for during our trip to Haiti and especially the love and acceptance of the children of Haiti. Tomorrow we fly home to Chicago, and next week I will visit my primary care physician for my annual physical. The waiting room and exam room at my physician’s office is luxurious in comparison to the setting in the clinics that we held here in Haiti, but the compassion and quality of care provided by Rush physicians in Chicago is no greater than that of our medical team in Haiti. Many thanks to our team: Stephanie Wang, MD, team leader; Joel Augustin, MD; Cynthia Waickus, MD; Babs Waldman, MD; Monal Joshi, MD R3; Anna Murphy, RN; Kathryn Koren, PT; Sandra Unger; and Dave Unger. This entry was posted in Haiti Journal, Rush University and tagged Haiti earthquake, humanitarian aid, Rush University Medical Center. Bookmark the permalink. I am inspired reading the journal and it makes me proud to be affiliated with the hospital/university and it’s people.